Tonight, the first debate of the Democratic party contenders for the 2016 Presidential Election is hosted by CNN and Facebook. 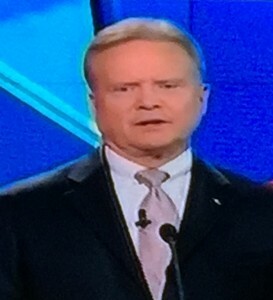 In the 2012 election, I graded the neck wear of the candidates at the debates and continued that in the GOP contender debates earlier this year here and here. These should not be considered any comment on the policies or political stances of the candidates, nor should any grade be seen as an endorsement or critique, save to the sartorial choices made. 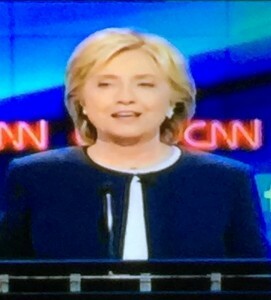 This was not the greatest example of sartorial choices, but we owe it to the candidates to give an honest look. Proportion – Does the proportion of the tie match the proportions of the suit? 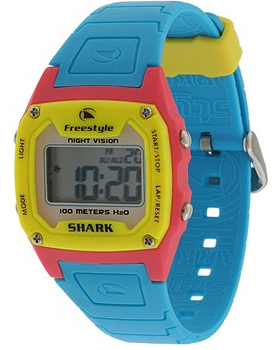 Do these proportions work with the individual wearing them? Sec. Clinton will receive a grade based on analyses other than the above, though related in terms of color, proportionality, and subjective style analysis. Gov. Chaffee gets some credit for the unorthodox color in his green tie, but the pattern did not work well on screen. It was just a little to large and a little too small at the same time. The proportion of his knot, and his tie to his suit was fine, but the knot itself looked sloppy and lacked a good dimple. I also had to knock him for a suit that was too large as well as the awkward high button stance for the suit jacket tonight. Secretary Clinton was fine, but that is as far as I can go. The idea of going primarily blue is a good one for her, but the white shirt or blouse underneath seemed a little too asymmetrical like in the photo above. Also, the center cut, fastened at the neck, of the jacket made her appear to balloon out in her torso. GOv. 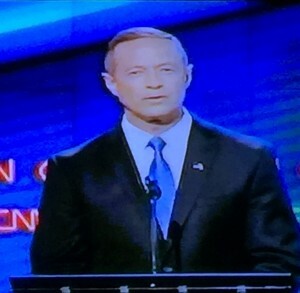 O’Malley lost a chunk of points because his suit was just too big. It appeared to swallow his shoulders, leave pools of fabric beneath his arms and exxagerated his youthfulness in a bad way. Also, he suffered from a problem several of his Republic counterparts did as well – a new modern cut cuit with thinner lapels paired with a classic tie that was far too wide in the prportions. The color of his tie was good, with a sharp blue and a subtle pindot that gave it a little texture, but his knot was too small for the collar of his shirt and the lack of a dimple further made his neck look too small compared to the overly large shoulders of the suit. 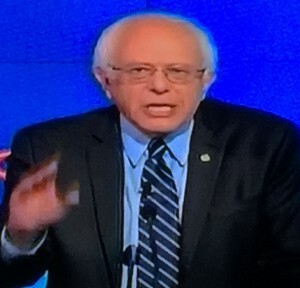 Senator Sanders was knocked for failing to button his suit jacket at the lecterns, as described ahead of the debates. Similar to Gov. 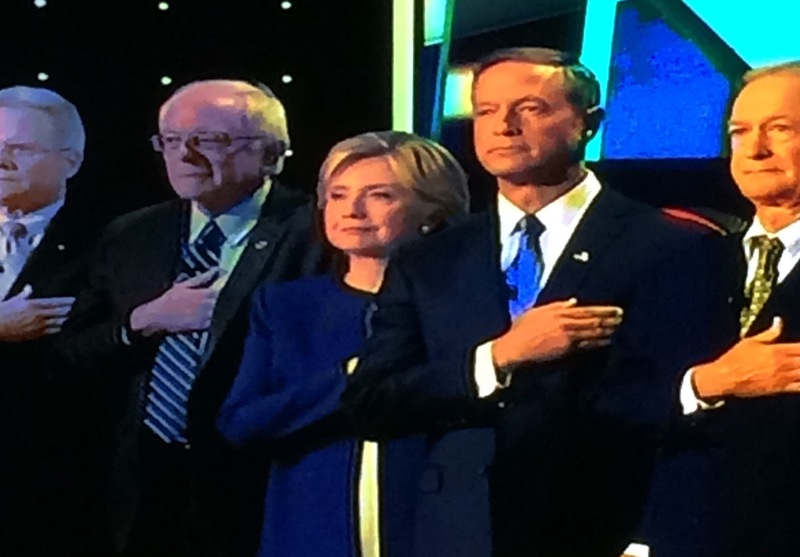 O’Malley, Sen. Sanders has a modern cut suit with thinner lapels improperly matched with a wide tie. Unlike Gov. O’Malley, Sen. Sanders had a good dimple in his tie, though he too could have benefitted from a wider knot. The Senator’s suit was a little too large, but not as out of size as other candidates. This was a hard one, as my gut response to Sen. Webb was to rank him lower, but my pseudo-objective scoring metrics left him with a B-. 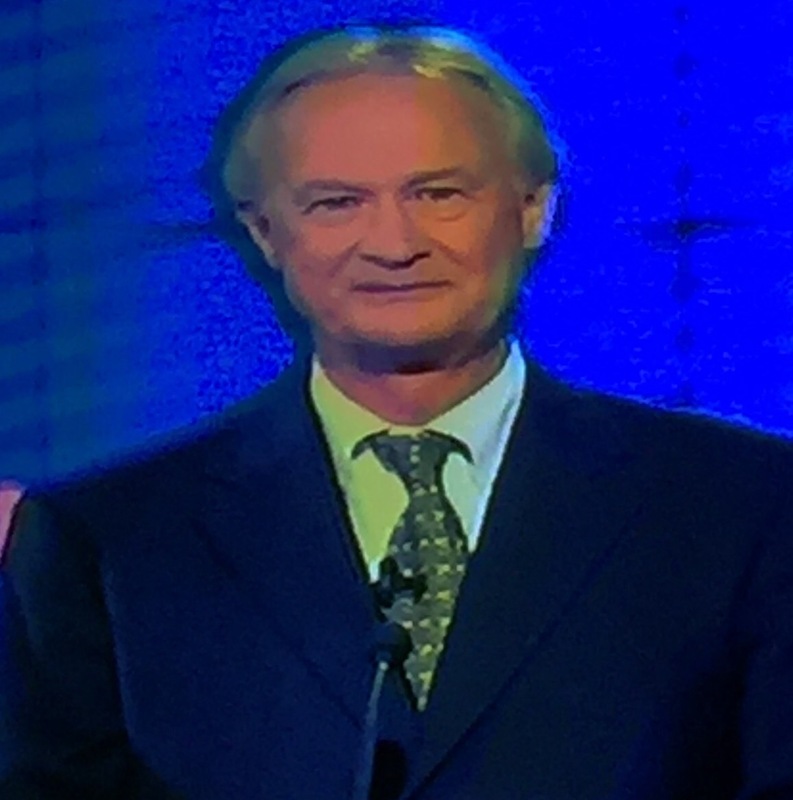 Of all the candidates, he had the best tied knot with the perfect dimple. The proportions of his tie to suit were also very good. His tie, however, was an awkward red and white pattern that bled incessantly on the screen. 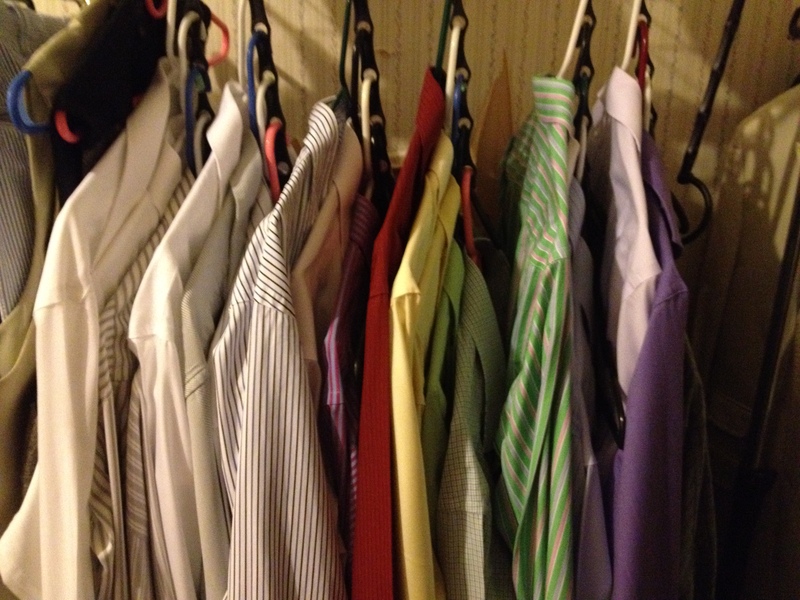 He shirt was also a half an inch too small in the neck, in my opinion, coupled with the button down shirt (i.e. buttons attaching the collar to the body of the short) made it look like an older man squeezing into clothes from his closet. There you have it – the first neck wear and sartorial grades for the Democratic Candidates in this 2016 Election Cycle. Think I got something wrong? Was I unfair compared to my treatment of the Republic candidates?